The Patriots faced an unprecedented task in the second half of Super Bowl 51, and they knew it. But in the end, New England did what they always do: they took it one play at a time, and they prevailed. HOUSTON — It takes two to dance like this: one going forward, the other backward. The New England Patriots and Atlanta Falcons stood face to face here Sunday night, hands clasped, and skipped to a Super Bowl finish unlike any we’ve ever seen. It was the NFL’s greatest comeback and its biggest collapse, a product of so much done right and so many things gone wrong. 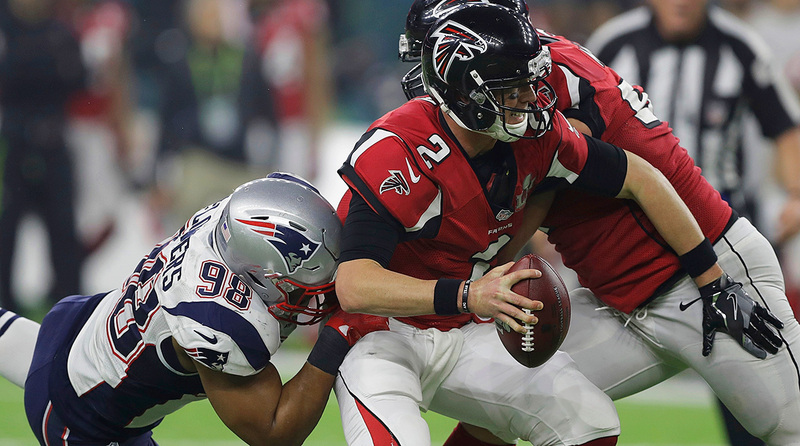 The Falcons led the Patriots 21–3 at halftime and 28–3 with 8:31 left in the third quarter. New England’s deficit was too great, and Patriots defensive end Chris Long knew too much. Long’s father Howie is a Hall of Famer. Chris grew up on the NFL. He knew nobody had ever done what his team had to do. 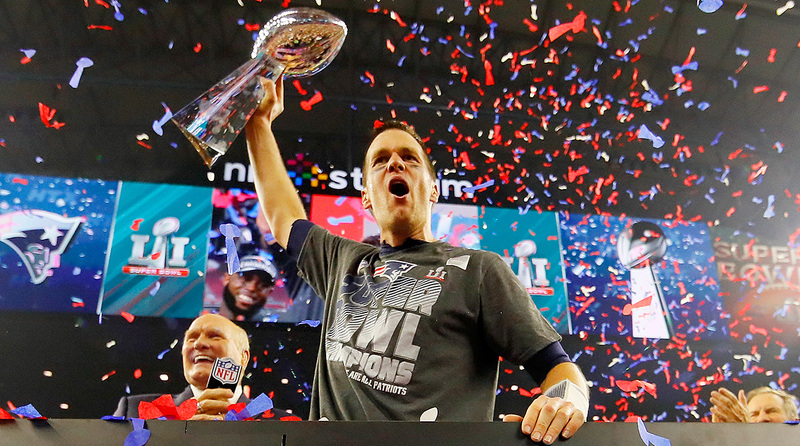 This is the story they’ll tell in New England: Tom Brady leading the Patriots to 25 unanswered points to force the first overtime in Super Bowl history, then another six to finish it. In Georgia, fans will talk about the time the Falcons blew the Super Bowl. Both are true stories. First the Patriots believed they would win, and then the Falcons seemed to believe the Patriots would win. Perhaps Atlanta was just exhausted. 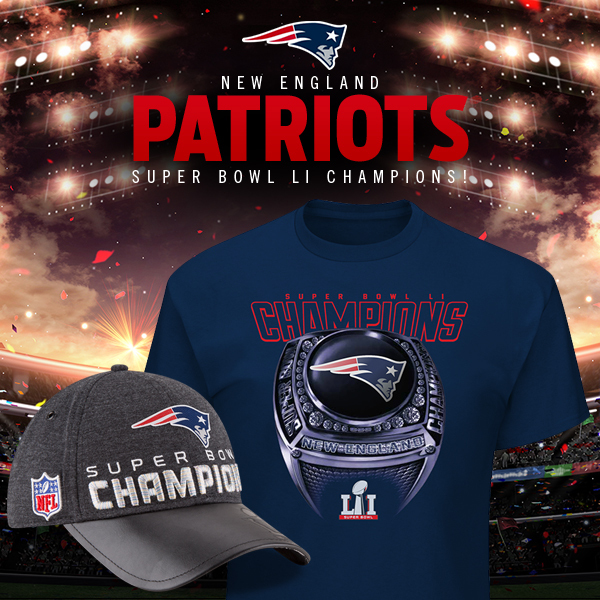 By overtime, when James White ran for a one-yard touchdown to complete New England’s 34–28 comeback win, the Patriots’ fifth Super Bowl title seemed as inevitable as the sun giving way to the moon. You want a cigar? Ask Bob Kraft. There he was, passing them out in the New England locker room while he shook the hands of players that even serious Patriots fans would not recognize. The Patriots have learned this much under Kraft’s ownership: Brady is the best quarterback of all time, Bill Belichick is the best coach ever, and they can’t win Super Bowls by themselves. Belichick cannot make Danny Amendola catch a 17-yard pass from Brady. But he can make smart decisions, some big and some small, and some bigger than they seem at the time. Nobody gave it much thought when Belichick, down 28–3, went for it on fourth-and-three in his own territory with 6:46 remaining in the third quarter, but let’s be clear here: A lot of NFL coaches would have punted there. They would have been wrong, but they would have done it. Maybe they would have feared turning the ball over on downs and getting blown out. They would have rationalized. And this is the essence of Belichick: He never thinks about fallout. He thinks only of winning the game. Brady completed that 17-yard pass to Amendola. Then Brady scrambled for 15 yards on third-and-eight. The Patriots scored their first touchdown. Stephen Gostkowski missed the extra point. The Falcons led 28-9 with 17 minutes left to play in the game. And Belichick went full Belichick again with an onside kick. Too early? Didn’t matter. It failed, but that didn’t matter either. Needing a single first down to get in prime field goal range, the Falcons weren’t able to get the ball to any of their best playmakers: Julio Jones, Devonta Freeman, Tevin Coleman or Mohamed Sanu. They ended up punting. Still, Atlanta should not have been worried. The fourth quarter had begun and the Falcons were up by 19. In NFL postseason history, no team had ever blown such a lead. The Patriots drove down for a field goal. It was 28–12 with less than 10 minutes left. Still no reason to worry. And then … well, maybe you couldn’t see this coming, except that Jake Matthews did. Matthews is the Falcons’ left tackle. On Thursday, as the Falcons’ last media availability of the week was ending, I asked him if the Patriots’ defense did anything he hadn’t seen before. A few things, he said. So here was Dont’a Hightower, the Pats’ middle linebacker, lined up at left defensive end, just like Matthews said he would be. Freeman should have blocked him but he whiffed. Ryan should have seen him but he didn’t. Hightower strip-sacked Ryan, the Patriots recovered, and the Super Bowl went from not-a-game to sort-of-a-game to whoa-this-is-definitely-a-game. The Pats moved 25 yards in five plays to make it 28–18. They had to go for two; any fan could see that. The hard part is having the right play ready. The Patriots had one they had been practicing for two weeks: A direct snap to the running back, either White or Dion Lewis. White ran in for the conversion. Suddenly it was 28–20. Arthur Blank stood in his pinstripe suit, a man worth three billion bucks who must have felt like a hundred. Blank owns the Falcons. His coach, Dan Quinn, was patiently trying to explain how the Vince Lombardi Trophy ended up in the Patriots’ hands. Blank placed his left foot on Quinn’s podium and listened. They do know how to match up and get open—it was obvious all game. There were times when the Patriots defense seemed overmatched by Atlanta’s offense, and here, with the Falcons leading 28–20, was one of those times: Julio Jones, the NFL’s best receiver, reaching up to grab a pass Ryan shouldn’t have thrown, then keeping both feet inbounds for a spectacular 27-yard gain. It was athleticism and technique rolled into something impossible. You could watch that replay 10 times without understanding it. Surely this was the backbreaker. The Falcons had the ball on the New England 23. They led by eight. Their kicker, Matt Bryant, made 28 of 29 field goals inside 50 yards this year; the only one he missed was blocked. The Falcons just had to run three times, burn some clock, and kick a field goal to make it a two-score game … except they lost a yard on their first run, and maybe started thinking about the wrong things. Their offense had been stalling. Their lead had vanished. They didn’t need to stay aggressive; they needed to go up two scores. But that urge to stay aggressive was there, and second-and-11 is usually a passing situation. So offensive coordinator Kyle Shanahan called for a pass. New England defensive end Trey Flowers—“That guy is a monster,” teammate Alan Branch said—stunted and bore in on Ryan. This wasn’t Hightower coming off the edge; Ryan saw Flowers the whole way. And this is what Shanahan wouldn’t say, but Ryan did: He should have thrown the ball away. It was the only sensible play. But Atlanta did not lead the league in scoring by throwing the ball away. Ryan tried to evade the rush. Flowers sacked him, and the Falcons ended up punting. The Patriots had the ball, down a score, with the best player in the history of the league at quarterback and three and a half minutes to work with. On the Patriots sideline, Chris Long believed now. They all did. Brady threw 62 passes Sunday. Two of them were among the worst he has ever thrown, and I’m not even talking about the interception that was returned for a touchdown in the first half. Twice, he had time to throw, planted his feet, and simply missed wide-open receivers. It was something Brady never does. But this is what Brady always does: Whatever is next. Failure does not stick to him. After getting the ball back on the Falcons’ punt, the Patriots snapped the ball 20 more times in this game (one would be negated by penalty). Brady threw on 18 of them, and on 16 of those he lined up in the shotgun. The Patriots were not fooling anybody with how they planned to win this game: They had Tom Brady and the Falcons did not. Brady threw two incomplete passes from his own nine yard-line to start the drive, but he completed his next one on third-and-10 for 16 yards to Chris Hogan. Soon, the Pats were on their own 36. Brady dropped back and looked for Julian Edelman. 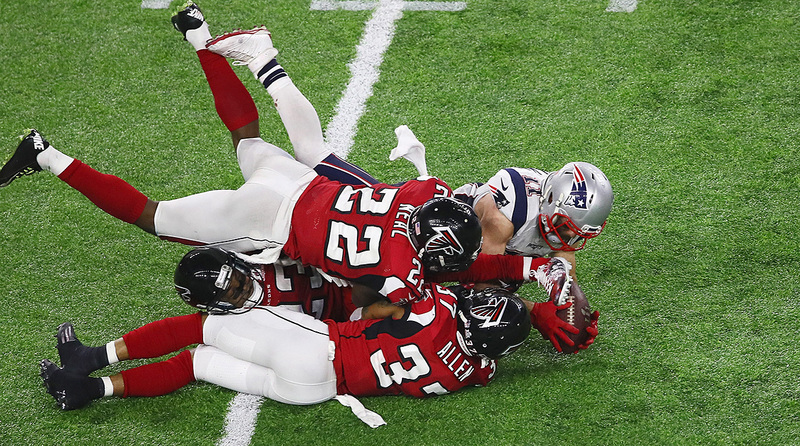 Edelman could play 200 more NFL games and he would never make the catch that Julio Jones made. He isn’t big enough. He doesn’t jump high enough. But this is another little sliver of genius from Bill Belichick: He isn’t looking desperately for a Julio Jones—he knows there is only one of them. Other teams fall in love with big, fast, mediocre receivers—faux Julios who don’t play the position well but who look like they can. Belichick finds small, quick, shifty, precise, sure-handed receivers who can track the ball. They get open and they catch the ball, which is all that matters. Edelman, a former college quarterback, is a master at it, and here he was, trying to catch a pass from Brady. Falcons outside linebacker Vic Beasley Jr. would say later that he had trouble finding the ball in the lights. Edelman had no such trouble. He somehow reached down and kept the ball off the ground for a 23-yard completion. Quinn challenged the catch and lost. Four plays later, White scored to make it 28–26. Brady hit Amendola for the conversion. The Patriots kicked off with 57 seconds remaining in regulation, and the Falcons’ Eric Weems inexplicably stopped a kickoff from going into the end zone and returned it only to his 11. Atlanta had burned all its timeouts, the last on the challenge to Edelman’s catch, and so the league’s most explosive offense again ended up punting. The Patriots never even faced a third down in overtime. Boom, boom, dink, dunk, touchdown. In the end, it was so simple. You come back from a 28–3 deficit the same way you win five Super Bowls and establish yourself as the greatest quarterback in history: one play at a time.